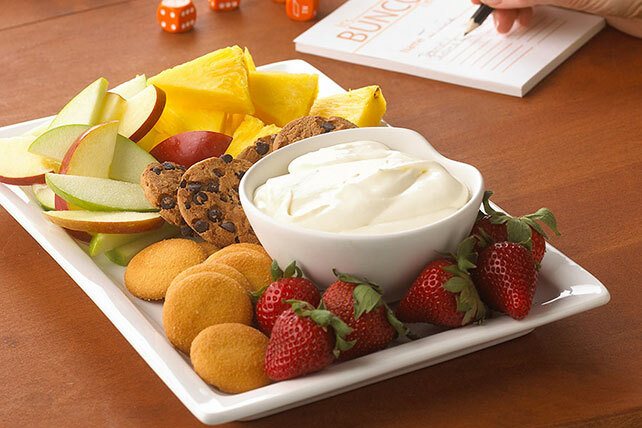 Combine just two things for PHILADELPHIA Dessert Dip, a delightful two-ingredient fruit dip! See how to make PHILADELPHIA Dessert Dip this summer. Serve with cut-up fresh fruit or assorted cookies. To easily remove marshmallow creme from jar, remove lid and seal. Microwave on HIGH 30 sec. before removing marshmallow creme from jar. This oh-so-simple dip can be prepared ahead of time. Refrigerate up to 4 hours before serving. Prepare as directed, adding 1 Tbsp. orange juice, 1 tsp. orange zest and a dash of ground ginger.